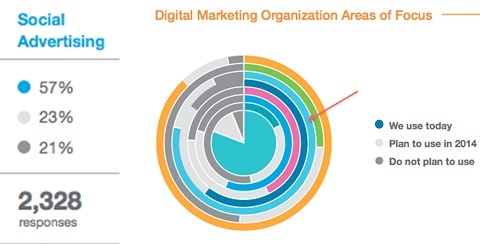 Want to know where social marketers are focusing in 2014? Looking for the latest social media trends to inform your marketing? Based on new research, here are five areas you should start paying attention to right away. Note: This article is based on Exact Target’s 2014 State of Marketing Report, which shows top marketing objectives, priorities and concerns for 2014. More brands are beginning to really listen to their customers. According to the report, 60% of marketers were using social listening strategies in 2013 and 24% plan to do so in 2014. The sad news is that only 31% of marketers think their social listening is fully effective. Consider the context of social conversations and respond strategically. Image source: iStockPhoto.com. Social listening offers opportunities to interact directly with consumers. But it’s not just about setting up a HootSuite account and watching tweets that mention your brand’s name. 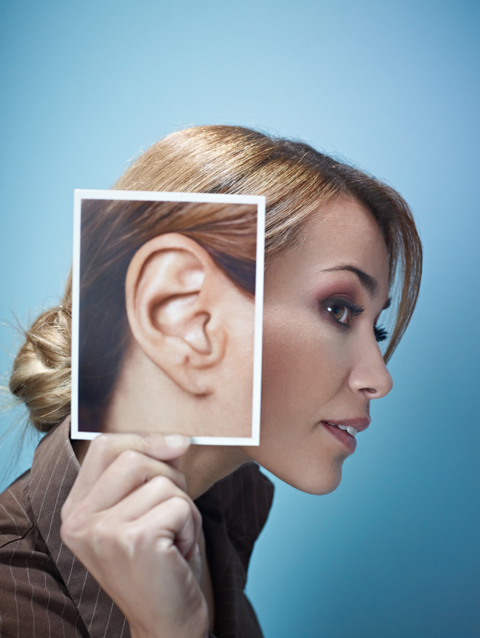 Don’t just listen; understand first—are you hearing one loud voice or a growing trend? Is positive sentiment due to great advertising or an awesome product? Understand the full picture before you respond. Consider the context of online updates and conversations—are consumers reaching out to you directly or venting to their friends? It’s their context (not yours) that matters. Your response should fulfill their expectations. Engage with the intention of delivering mutual value—consumers have shown they’re willing to give up some level of privacy in exchange for better service and incredible value. Demonstrate how listening builds relationships, rather than simply “intruding” on consumers’ conversations. People are still sensitive about privacy and listening for listening’s sake is simply creepy. The lure of social advertising is fascinating. Facebook, Twitter, LinkedIn and others are daily destinations for millions of U.S. consumers who spend an average of 37 minutes per day on those channels. 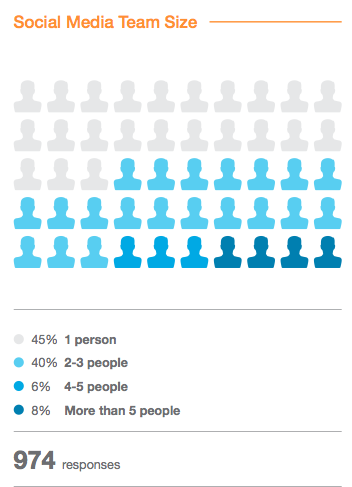 No wonder 57% of marketers used social ads in 2013 and another 23% are expected to start using ads in 2014. But again, only 23% of digital marketers find their social advertising efforts effective. Marketers’ budgets indicate the appeal of social advertising. The problem for marketers is that social ad options are very confusing. What’s the difference between a Facebook promoted post and a Facebook sponsored story? When should you promote a check-in story? And do social ads even work? Set your budget (start small). Research different ad types (how they work, how to leverage them and how your audience will perceive them). Experiment and create ad copy (two or three versions). 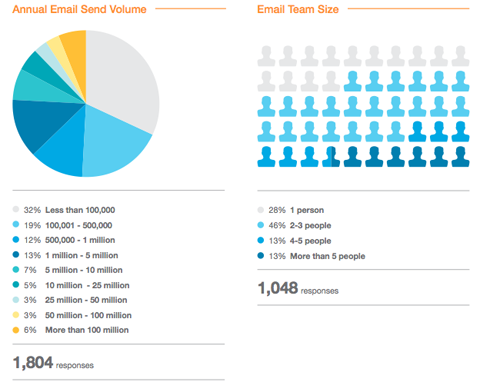 Email is core to business performance, but social is the other side of the coin. It’s important to understand the relationship between email and social. With email marketing, you have the ability to stay top-of-mind with existing customers, which helps bring them back to your door. Then by encouraging your email subscribers to connect with you on Facebook or Twitter, their friends will see your brand on their news feed, thus generating more social visibility for you. On the other hand, you don’t want to leave your social connections at the mercy of Facebook’s arbitrary algorithms. You want them to receive your content straight to their email inbox, where you have more control and can extend those relationships. Use email subject line testing to optimize Facebook ad headlines and vice versa. Incorporate your most popular email content into status updates (and vice versa). Test image effectiveness via email and incorporate into status updates (and vice versa). Just like sponsored stories, incorporate your fans’ enthusiasm for your brand into your email content. And finally, tease upcoming emails via a Facebook status update. The survey found that social media teams are becoming more common, with 57% of respondents having a dedicated team to strategize, execute and steward social media initiatives. Typically a social media team has three people or fewer. Having a dedicated team is key to social media marketing success. Most brands understand that having a dedicated team is key to social marketing success. It’s also clear that one-person social media “teams” are most common (probably due to small budgets or lack of buy-in from upper management). Start with a strategy. Know what you want to accomplish from social media and choose your social networks wisely. Create a workflow process. Schedule some time each day for routine social media activities (e.g., listening and monitoring, posting updates, networking and so on). The more you repeat these tasks, the better you’ll get at it. Develop quality content. You’ll need to create original content on a regular basis (e.g., blog posts, images, videos, graphics, etc.). Even with a small budget, you can get other people to create high-quality content for you by using a service like Fiverr. You can also get free images from Flickr or Wikimedia Commons. Get the word out. Let your co-workers and customers know that you have a Facebook page or a Twitter profile. Encourage them to engage with the company on these channels. It’s also a good idea to join an online community where you can tactfully get the word out to others (without spamming them). The more value you add to their conversations, the more receptive they will be to discovering and engaging with your online brand. While marketers are dedicating more time and resources to social, they’re not 100% sure how effective it is in terms of ROI. Thirty-four percent believe they’re currently seeing ROI, while 52% believe their social media efforts will eventually produce ROI. This is not good. Measuring social media can be tricky, but not doing it at all is damaging to business. Many business owners make the mistake of not measuring social media ROI. Know this—As long as you’re not measuring, you will never understand how social media marketing can benefit your business. Measuring helps you to be intentional about your marketing activities instead of spending time and resources on useless tactics that don’t work. Start by defining clear, measurable social media goals such as brand awareness (e.g., Facebook likes), lead generation (e.g., email opt-ins or content downloads) or customer retention (compare cost of retaining a social media customer vs. a non–social media customer). Then develop a content strategy to achieve those goals (remember that content drives social). Focus on one or two social channels where your target audience hangs out and gradually scale as your audience and your resources grow! 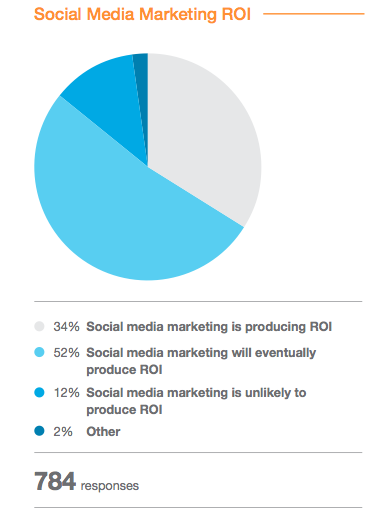 Soon you’ll be counted among the 34% who are seeing ROI on their social media efforts. What do think? Which of these social strategies will you be looking to improve this coming year? Please leave your thoughts and comments below. Patricia Maranga writes research reviews for Social Media Examiner. She is the Social Media Manager at US Pharmacopeia, a public standards setting organization. Follow her on Twitter at @predsicker.